If Franciscan places are everywhere people live in the spirit of St. Francis, then it's possible to build a Franciscan eco-network of support and co-operation. What might a Franciscan Eco-Network look like? The word 'eco' comes from the Greek word, 'oikos' meaning 'house', and is found in the words ecology, economy and ecumenism. An eco-network therefore could refer to a network of 'houses', communities where ecology, economy and ecumenism (& interfaith co-operation) interact in such a way that people are inspired to love their local place and beyond. Franciscans strive to live the holy Gospel of our Lord Jesus Christ like St. Francis of Assisi, and so the Franciscan eco-network could be one such community network conforming to the life of God - Father, Son & Holy Spirit - and respecting & enjoying God's creation as St. Francis did. On the webpages dedicated to each of the places listed - see lefthand side - I have included sites nearby that are protected under national and EU environmental legislation. Special Protection Areas (SPA's) are designated under the EU Birds Directive 1979 for the protection of birds whilst Special Areas of Conservation (SAC's) are designated under the EU Habitats Directive 1992 for the conservation of habitats and species. Natural Heritage Areas (NHA's) and proposed Natural Heritage Areas (pNHA's) are protected under national wildlife legislation. These special - natural heritage - areas must be protected so as to enhance biodiversity and human well-being. 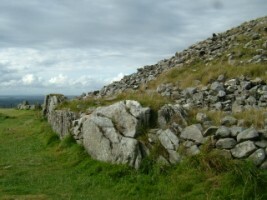 They are isolated remains of a natural ecological infrastructure that once covered Ireland, Europe and the whole world. We need to protect natural habitats so as to protect the species that inhabit them. All species have intrinsic value because they are created by God. Many species pollinate food crops, others are edible or hold curative properties, and still others uplift and delight the human spirit. Ecological corridors could help some species movement and gene pool replenishment thereby strengthening individual special areas and ecosystems, whole ecological networks and the earth which feeds and sustains humanity. Get to know the special sites near you and especially your own place - and help create a healthy environment for all! The locations listed here are only a few of very many inspiring places that have been touched in very real ways by the spirit and vision of St. Francis. This saint, lover of creation and patron of those who promote ecology continues to animate and inspire people everywhere to follow him in following Christ. So Franciscan places are everywhere people try to live the values of love and respect for creation, in peace and brotherhood. Franciscan places are to be found all over the world too like Assisi in Italy.